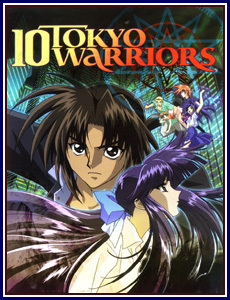 10 Tokyo Warriors Adult DVD Description: "The feudal lords who ruled the country were forever embroiled in territorial wars. The land was in a state of chaos. In the midst of this chaos, a warrior far superior to all others appeared. He was known as the Demon King. Now, 400 years later, he plans to rain destruction upon Tokyo and only ten warriors have the power to stop him. The only problem is…the 10th Warrior. "Jutto Segu is a freshman at Fuuin High School. One day, he is approached by a group of strangers who claim to be the reincarnation of valiant souls who long ago defeated the Demon King, supreme leader of the Kyouma. The Demon King is now about to be reawakened. In order to defeat him, they will need the power of 10 warriors."